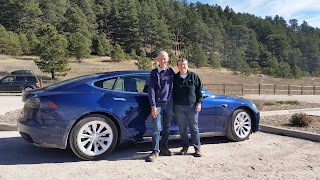 Mike & Mary Ann Witter are our latest members and they live in Colorado Springs, CO. We just missed them at the last quarterly meeting, we would've loved to see their new Tesla Model S75. Please make them welcome, I hope they like our group! Yes, I have the homelink garage door issue. I have another issue, confirmed by Tesla service and Steve at Colorado Detail. One of the recent software updates had made the ultrasonic sensors more sensitive to wrap coverings (like the wrap I got from Steve). My 4 front sensors don’t work most of the time – no dash indicator, and the car ran into garbage cans I had set up to test forward summons. Called Steve, and he confirmed that he is getting lots of calls from folks with wraps that cover the sensors asking to have the wrap taken off the sensors. I’m visiting him tomorrow for that … will keep you informed. According to the Tesla forums, there is a problem with the cars opening a garage door using HomeLink since the last software update. I am personally having this issue. Behavior: the car fails to transmit the door opener command upon returning home. Workaround: when you return home, boot the main screen by holding down both scroll fields on the steering wheel. 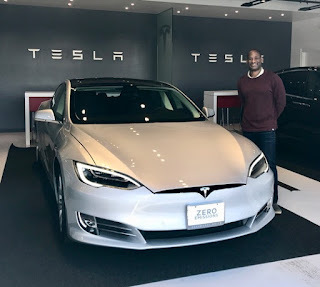 Once rebooted, you should be able to open the garage door. A future software update is anticipated to fix the problem. 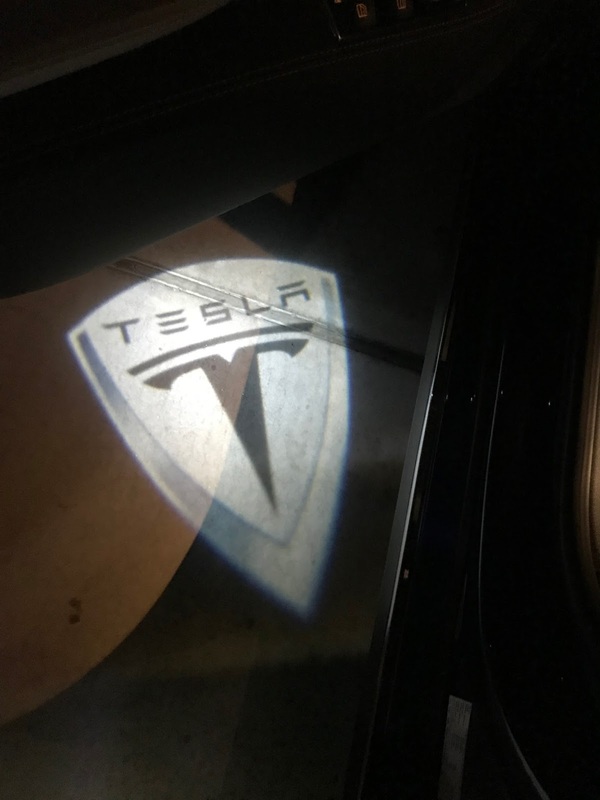 I'm an honorary member of the Irish EV Club on Facebook, and one of their members made me aware of a replacement puddle light for a Tesla Model S or X. They're available on Amazon (links below) and shipped directly from China. The replacement light shows the Tesla logo on the ground when the door is opened (see the photo below). The maker has puddle lights from many manufacturers so just look for your brand. A couple of notes: I bought a Harbor Freight dash trim removal tool to get the light out. I think plastic/nylon removal tools are preferred to prevent scratching your leather/plastic around the light, but my son-in-law got the lights out using the metal Harbor Freight tool with no damage. I will happily share my tools with anyone that wants it, don't buy one for yourself unless you want to. 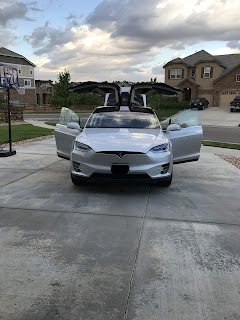 Also: the box of replacement lights included an extra accessory light that is MUCH brighter than the OEM lights I got from Tesla - it's one LED (Tesla) vs. four. After replacing my hatchback lid light with the new one I ordered a set of four to put in the trunk/frunk/glove box. Highly recommended! We met Stephen Sunkel at our quarterly meeting today, we hope we made him welcome. We had new members and soon-to-be members at GOTG Trading Post today! 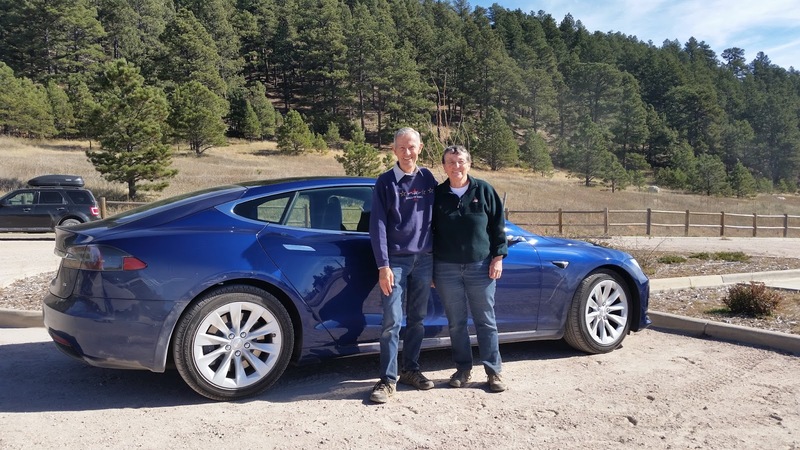 Thanks to Christopher Coleman, our new member, for the photo. Please welcome Christopher Coleman from Colorado Springs, CO. Hopefully we'll see him at our next club meeting! 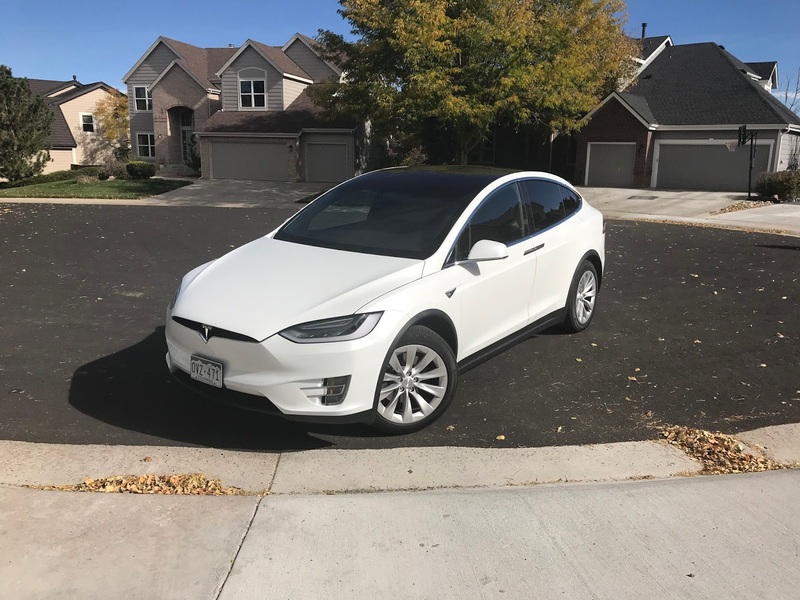 Lynn and Jane Higgins of Higgins Realty are our latest new members from Highlands Ranch, CO. Make them welcome when you see their Tesla Model X or Chevy Volt! It is about time to plan a fall general membership meeting. 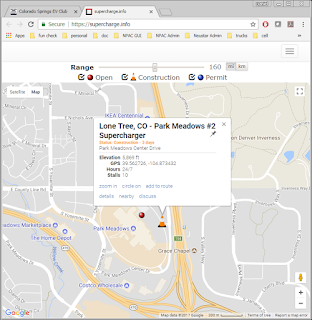 A check of the old event calendar shows that a good date for a meet-up is Saturday, October 21. How about 11:30am, eat at NOON??? Let’s DO it! Where? How about one of our favorite places, the Garden of the Gods Trading Post in Colorado Springs? Put it on your calendar NOW! I will remind you about a week prior. 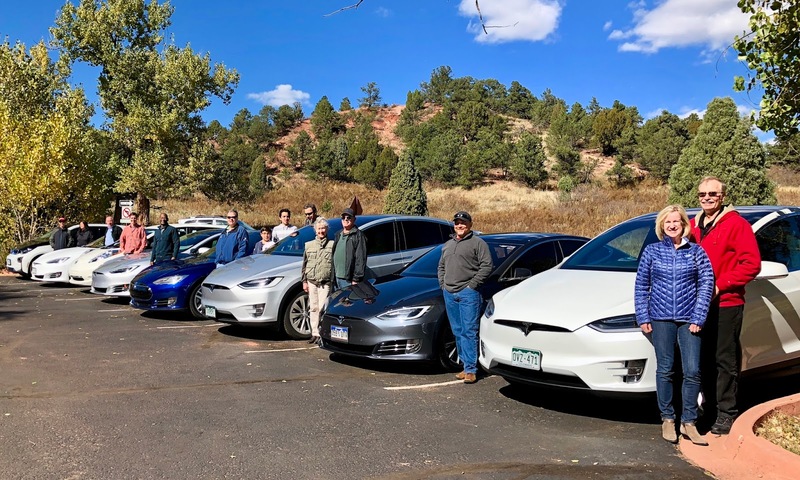 Come on out and see all the EVs and talk EVs with us! Have lunch! Tons of fun for everyone! 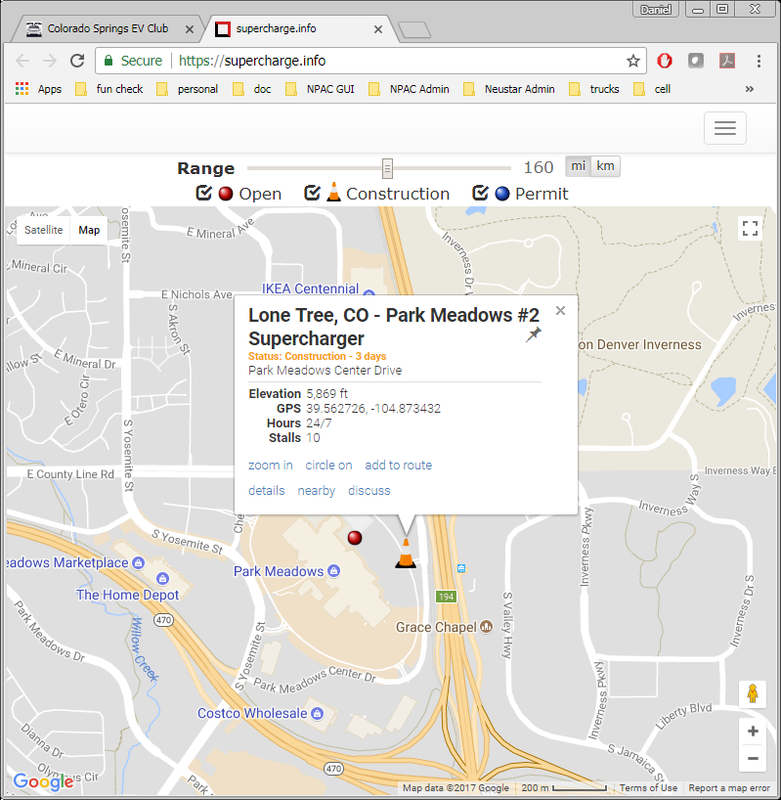 Thanks to Dan Rosenblatt for notifying me about the new Tesla Supercharger location at Park Meadows Mall. Newest member Josh Peterson is from Cripple Creek, CO! 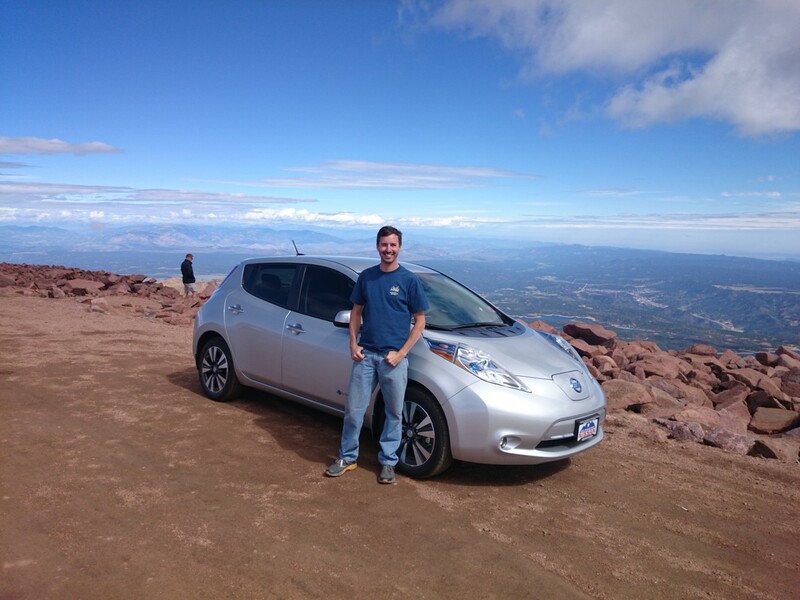 Our latest member Josh Peterson doesn't have an EV but lives on solar energy in Cripple Creek, CO. Let's make him welcome and let's hope he can help us learn about solar living! 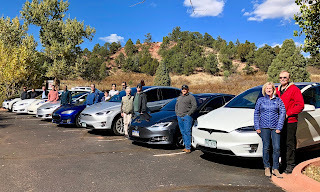 To help spread the word about our club and members, we now have an open group on Facebook titled "Colorado Springs EV Club". Please look for it and join. We will still concentrate our communication using email and this blog, but Facebook is so popular that we have decided to make a presence there.